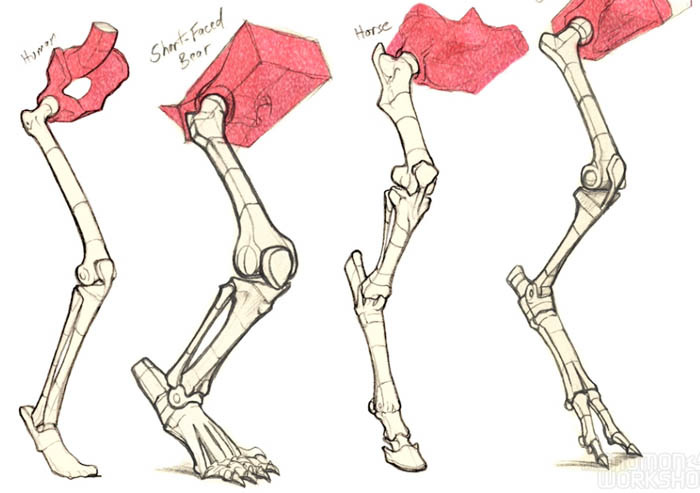 Marshall Vandruff’s training video called “Introduction to Animal Anatomy for Artists” grew out of a popular six-month series of articles that he wrote for ImagineFX magazine. 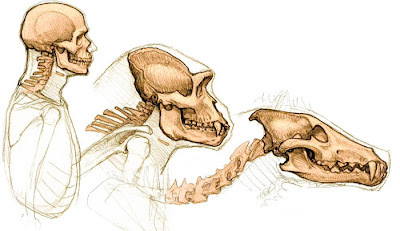 The diagrams that he developed for that series used analogies and comparisons to explain how the basic forms of the skeleton and muscles vary from one animal to another, and how they resemble similar forms in humans. In his 82 minute video version of those articles, Vandruff presents a wealth of information through a series of diagrammatic drawings that develop before your eyes. The guiding intent is to give you the facts, but to simplify them so that you can remember what's most important. If you can remember and internalize the forms, you can use them for anything, including creatures and monsters that you invent. Vandruff's own sketchy monsters, drawn in pen in time lapse, are peppered throughout. 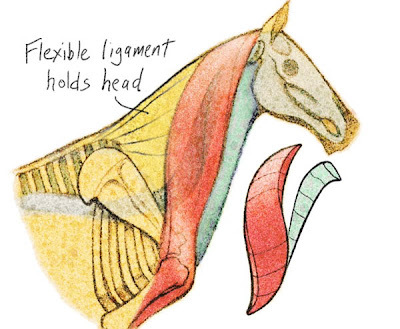 Vandruff's ability to present the facts simply is especially helpful, because some animal anatomy texts are inclined to pedantry, detailing the names of each of the protuberances of individual vertebrae or the names of the individual carpal bones. All that detail is hard to remember and not that useful in practice. The audio features Vandruff's voice as a voiceover, describing what to look for with humor and with colorful examples. He has experience in radio, and his narration adds a lot. His voice is reassuring and measured. The information is well scripted. "I spent lots of time honing it down to the fewest words I could, because I could," he told me. "When I teach live, it's always too many words." Transitions between sections are accompanied by riffy synth beats composed by his son, with references to silent movie scores. Marshall Vandruff has taught animal anatomy at Cal State Fullerton and Laguna College of Art and Design and later at seminars at studios and schools throughout the Los Angeles area and beyond. looks pretty cool, always intrested in learning more anatomy. have you viewed it then james? and is it worth the $40? Yes, I have watched it and I do recommend it, especially if you like learning from videos and if you're interested in learning animal anatomy. It's not one of those long, slow art videos that you only watch once. He's a good explainer, and his presentation is concise, with a ton of information, so it is something I plan to return to again and again. Marshall is a very lively teacher. I am sure if this video is anything like the human anatomy lectures I have seen him give then it will be great. Thanks for the post! I wouldn't have found out about the DVD otherwise. The guy's a genius. You can find more of his material at TAD and the anatomy issue of ImagineFX. The latter is available as a digital purchase. On the strength of your comments, I bought this video. (It is actually a series of short videos, available as a download.) It is very useful & easy to follow. It is like a class; he tells you to pause from time to time and practice some particular exercise yourself. "After you have done it a couple dozen times, you will be able to draw them easily." I have to resist the temptation to watch it all the way through. Go slow and practice what he says to practice. His aim in it is to teach people to be able to create their own creatures with lifelike movements and action. That's not my aim; mine is to draw lifelike creatures that already exist, but to be able to draw them withot needing photographic references for every pose. I agree. It is a great video. Marshall is a natural teacher, and the information was presented in a clear and concise way that made it very easy to absorb. I would definitely recommend it as well.